waiting time is always the hardest time... And now it's nearly over for me! As I had announced in our thread "What's on your list for 2011?" 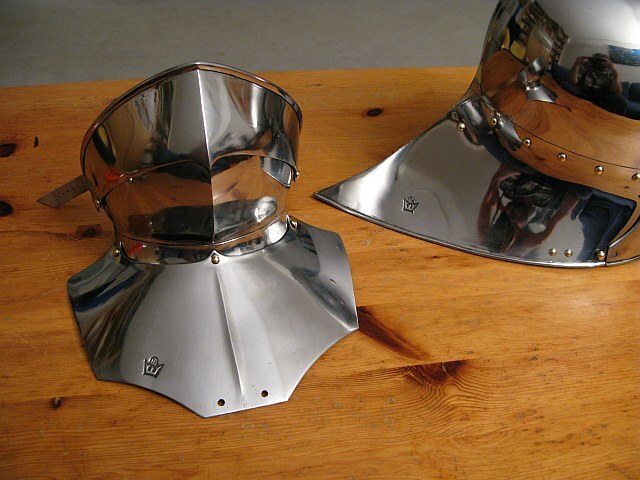 I had ordered in december a german sallet by Christian Wiedner ( http://www.plattnerei-wiedner.de ), a german armorer, who makes excellent reproductions of european medieval armor. As a template, he used this sallet, currently exhibited at the Walters Museum of Art http://art.thewalters.org/viewwoa.aspx?id=497 in Baltimore. It's of supposedly south german origin, dated between 1480 and 1490. It was part of the Princes of Liechtenstein collection at Vaduz. Since my armorer did sent it yesterday by mail, I am now eagerly waiting to get the package. To shorten the waiting time, I'll post a work in progress-shot, he had sent me in march... I visited him back then for trying on the sallet and he made some alterations, so that my potato-like head will fit snuggly now (I hope so). So now please join me in the last few hours, until the package arrives! 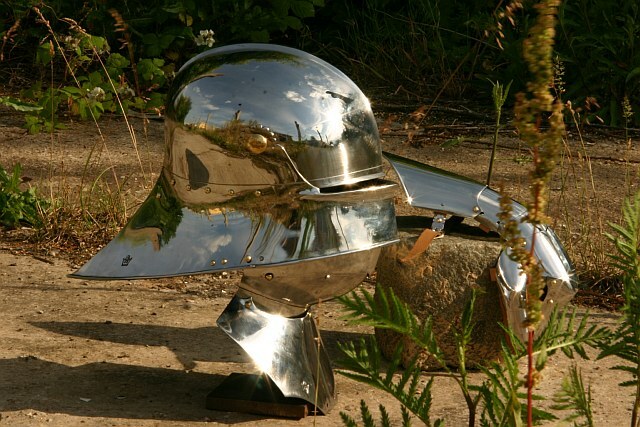 German sallet (1480/95) by Christian Wiedner, work-in-progress-shot. looking good! was it raised as a single piece? Chris could have done that, but it would have been too expensive for me. So he raised it from two steel sheets and fused them. The good part is, that the metal is now slightly thicker at the rear end, than raised from a single piece and will withstand blows better without deforming. The bad part is, that it's now a little bit on the heavy side. I am sure I can post some pictures later this day! This looks fantastic Thomas - you must be really chuffed! That's just gorgeous. Does that mean you're collecting a full 15th century kit next to your 13th century one? You've set a very high standard for the rest of your harness! That's beautiful work! At first: thanks to all of you for your compliments, which belong to Christian Wiedner! I am very satisfied with his work and his customer care was very good, too. We had several dozens of e-mails flying back and forth during the process. @Hendrik: Until now I don't plan to wear a mailcollar with the bevor, maybe I will see it's necessity in future. As far as I know it was optional to wear a collar alone, together with a bevor or only the bevor. @Christian: Thanks! Yeah, I am really happy with it. 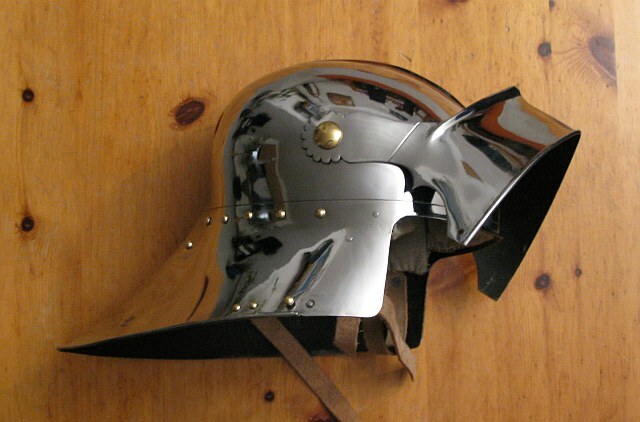 The sallet sits really tight on the head and holds even without the chinstrap closed very well. I visited Chris earlier this year to test the fitting and he made some alterations right away (took us half a day). It was a truely inspiring visit in his smithy, seeing him hammering the red glowing steel into shape. @Sander: You nailed it on the head! Since I started studying the longsword, the urge to get a sallet and a pair of gauntlets build up in me... now I gave in to that feeling. 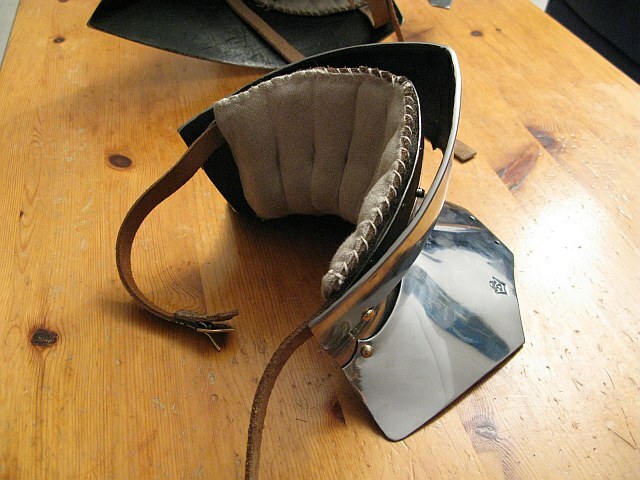 I will try to get a footsoldiers kit without leg harness, dated between 1480 and 1490. 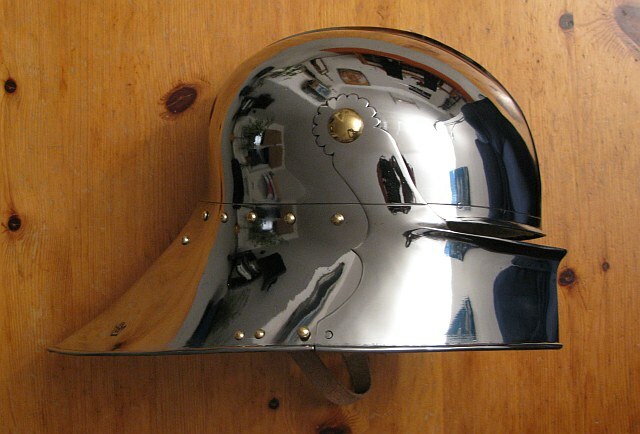 @Sean: Yes, the sallet may be a bit flashy, but when I saw it the first time in THoogs flickr-stream, I fell in love with it. I knew: this is the one, I want to have replicated. I am sure the rest of the harness will match it's quality, since I already talked to Chris about getting a breast, ellbows and shoulders. And if you look at the right corner of the outdoor picture, you'll get a glimpse of my Kienbusch-gauntlets. I would have included pictures of them as well, but I am going to sew a pair of leather gloves for them first. It's a tricky project I'll have to finish now. Sean is right, that's an epic sallet Thomas! Congratulations! 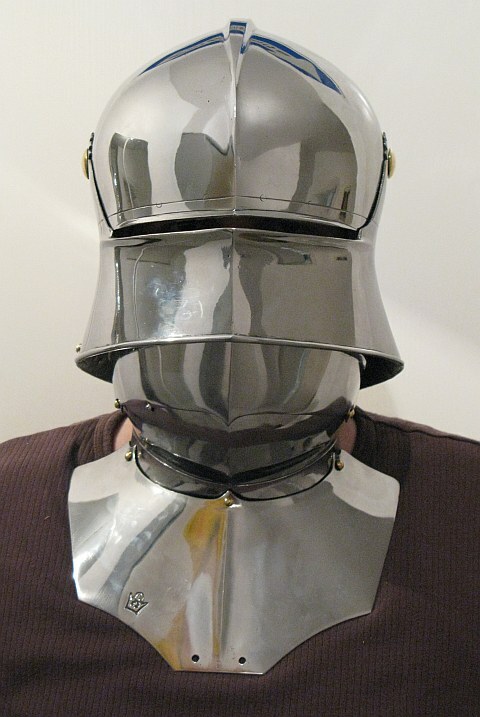 What breastplate do you plan to wear the helmet and bevor with? Because there are hardly any with lace holes. I knew, I had seen those big rivets somewhere before! When I saw the pictures of the export schaller, I thought immediately of you. Congrats to your new sallet! The doublet ist another project, perhaps for this autumn. We already had some discussions about it, as you surely remember. I will do some more research on this topic (collar, yes or no), counting on your input as well. Chris will make me a copy of one of the von Matsch Breastplates (Gaudenz's). He showed me other ones, which had shifted arms instead of the two pieces. But we decided to go with the somehow "cheaper" von Matsch. I am not a thin herring, so the von Matsch will suit me well, I guess. And to William: I am surprised how good the sight through the slit is. The sallet is tailored to my head, so I don't need any extra padding or arming cap (besides a hair net perhaps ) it sits very tight, it doesn't shift nor bobble up and down. You can look to the sides and to the front, very well. The gap between bevor and visor enables vision to the ground before your feet. 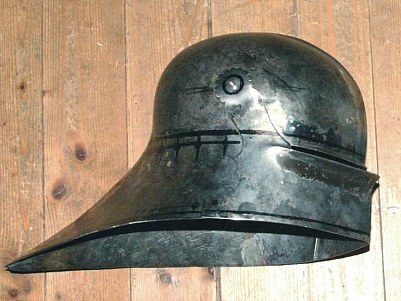 The hearing is not affected by the sallets padding. I still have to take it to the test in sword fighting. I'd love to know your impressions after fighting in it. Please let us know! That is one beautiful helm! the opther thing ive heard is that the eyeslit can , quite dangerously partly help guide arrows inside. like the spectacles on a spectacled viking helm. and im curious as to how one hears in a helm like that i kn0ow some armets, bascinets and close helms had some sort of ear perforations..
Well the ridges below the eyeslit would tend to deflect any arrow not precisely going into the slit that would have hit the eye anyway if there wasn't a visor. I think it's mostly a psychological thing that what little area that remains vulnerable one becomes much more conscious about. In very low probability instances an arrow or a sword point might be guided to the eye by the slit or once in the slit it might not have anywhere else it could go but into the eye. Look at it another way: An arrow is aimed at your face, do you prefer the visor being down or being up ? What are the odds of being injured with the visor up versus the visor down. A well designed ridge or flange will stop any arrow from being guided into the slit unless it is already perfectly aimed or hits precisely on a very narrow surface ( flat if any ) just below and or above an eyeslit. Oh, and very nice Sallet. And just a side point: there is no such think as a "spectacled viking helm". The very few spectacled helmets are either funeral helmets, or not viking, or both. I know of no prove whatsoever that vikings ever wore such helmets. Apart form the fact only very very few persons during the viking era were wealthy enough to own any. So such a problem like that with the arrow simply would not have occured. What about the Gjermundbu helm?